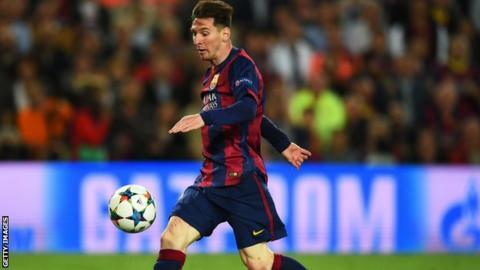 Barcelona forward Lionel Messi is "a player from another dimension", according to the club's manager Luis Enrique. The Argentina international, 27, scored twice in his side's 3-0 Champions League semi-final first-leg victory over Bayern Munich at the Nou Camp. "We created many more chances than our rival and in a thrilling final 15 minutes he put them in," said Enrique. "Beyond what Leo did in attack, look at what how much he ran in defence." After Barcelona missed several opportunities in the first half, German champions Bayern were slowly starting to impress themselves on the game until Messi struck on 77 minutes, rifling the ball past Manuel Neuer from the edge of the area. Just three minutes later he skipped past Jerome Boateng before lifting the ball over Neuer. He also provided the assist for Barca's third goal, scored by Neymar in injury time. Barcelona midfielder Andres Iniesta said Messi had left him speechless, while Javier Mascherano enthused that just having the Argentine would always give them the edge against any opponent. "We have Messi so it's an advantage for us," Mascherano told Sky Sports. "He's a player that is impossible to describe. It's just... you have to watch him." Defender Gerard Pique added: "[Bayern boss] Pep Guardiola knows Messi, and he knows that if he is inspired nobody can stop him, he scored two spectacular goals." Footballers past and present were quick to praise Messi's two-goal performance. Messi's team-mate Luis Suarez tweeted: "Picture with the best in the world"
Ex-Holland and Barcelona striker Patrick Kluivert posted: "He really is from a different planet. Messi, even if you are supporting another team you have to admit this." Match of the Day presenter and former England captain Gary Lineker tweeted: "It's such a joy to watch Messi. The greatest!" On-loan Leicester defender Robert Huth tweeted: "Don't think there can be anything worse in football than running backwards, one v one with Messi." QPR midfielder Joey Barton tweeted: "In any other era Cristiano [Ronaldo] would be best of his generation. In the Messi era everyone who has ever played is number two." It is the debate that will not go away but Messi's two goals in the Nou Camp on Wednesday put him ahead of Cristiano Ronaldo as the leading scorer in Champions League history. Ronaldo's header for Real Madrid against Juventus in Turin on Tuesday put the Portugal forward back ahead of Messi on 76 goals. But in three second-half minutes against Bayern, Messi re-established his lead and he now has 77 goals in the competition. Messi was playing in his 100th game in European competition and he has scored 78 goals - 77 in the Champions League and one in the Uefa Super Cup. In those 100 games he has won three Champions League titles and two Uefa Super Cups and been the top scorer four times in the competition.